When setting up your first forge for doing a little blacksmithing or, a foundry for metal casting one of the fundamental issues is how to get enough heat. Below I’m going to tell you how to make a propane torch burn hotter. Now, charcoal and coal can be used for heat and are excellent fuels. Nonetheless, for ease and availability, it’s hard to beat a 20lb propane tank as a fuel supply. The problem is most off the shelf torches from home depot or the like don’t put out enough heat to do much for our uses. Along with hacking a propane torch to get more BTU's, I’ll also show how to build a DIY forge burner with parts easily found on Amazon or at a hardware store. And then show you a budget-friendly done for you burner that is cheaper than what you can buy the parts for! What makes a propane torch burn hotter? An air-only propane torch will burn at around 1,990 °C (3,614 °F). That is plenty of degrees to melt many metals like aluminum 660.3 °C and copper 1,085 °C, right? Just like you wouldn’t expect to go drag racing with a smart car and its tiny engine, your off the shelf burner from the hardware store just doesn’t pump out enough fuel for what we will need it to do. There is a fairly simple hack you can do to most store-bought torches to increase the flow of fuel and air and create a bigger hotter flame. I personally don’t recommend this as it could make the torch pretty dangerous. If you choose to do this you do so at your own risk. Watch the video below to see how to make a propane torch burn hotter. To really get metal to the temperatures where it can be worked at an anvil or even melted you really want a burner that lets you control the flow of gas and air and get a focused blast of heat. There are 2 options Do It Yourself or Buy it. Here is a great burner you can make with minimal tools and no need of a welder. 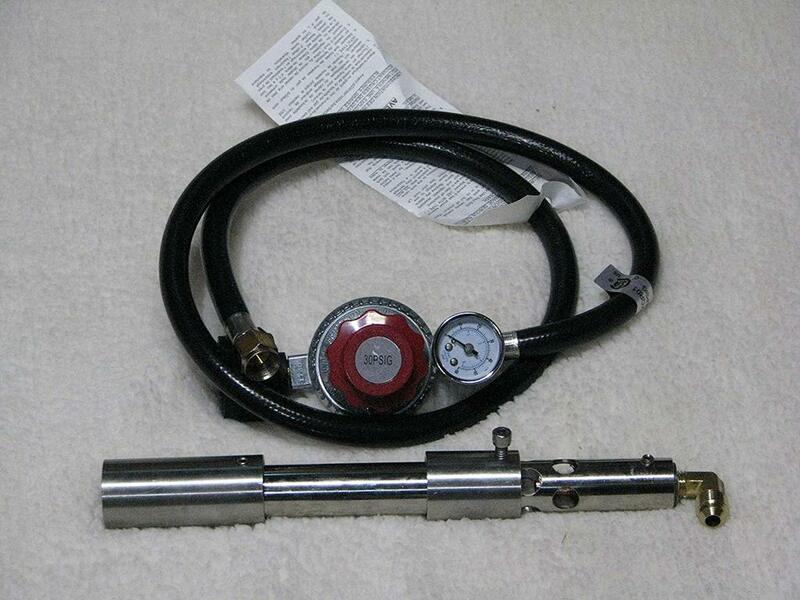 However, if you need to buy all the tools and taps it can quickly start to get more expensive than a pre-made burner. I’ll post a parts list with links to all the parts below the video. Click here to see the full parts list with everything you need to build it. Going DIY still costs a quite a bit and takes time . As well there are things that can be easily messed up like not getting good seals when threading the pipe that can cause gas leaks and potentially be dangerous. For just a few dollars more (or less if you needed to buy tools for the DIY version ) than building it yourself, you can pick up a pre-made burner that will work out of the box. Both are great options at a very decent price. They include everything you need to hook up to a common BBQ propane tank and light. The difference between the 2 is the fitting where the gas line connects. One goes straight out the back and the other connects at 90 degrees. Simply choose the one that works best for your setup. For more about blacksmithing and getting started at home checkout my guide to beginners blacksmith tools. Want to Forge your First Knife? Here is what you need to know to make it happen.